Remember the system-wide PulseAudio Equalizer? 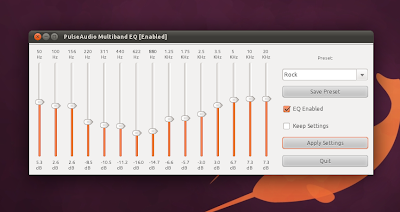 Today I was updating most of the packages in the WebUpd8 PPA that I didn't update yet (not many actually) for Ubuntu 11.04 Natty Narwhal and I've remembered about some patches for PulseAudio Equalizer so I though I'd add them with this update. These patches should fix the "Max Volume" bug and a bug with settings persistence. PulseAudio Equalizer has been updated for both Ubuntu 11.04 Natty Narwhal and 10.10 Maverick Meerkat. Update: the tool is now available for Ubuntu 12.04, 12.10 and 13.04. Oh, and if you find a bug, unfortunately there's nowhere to report it because PulseAudio Equalizer is no longer maintained. Thanks to funnylife_ma and Fedora :) for the patches!